The Institutional Dataverse feature allows you to customize and manage a central space for research data from researchers at your institution. Institutional Dataverses provide users with a central space to browse, search, and upload data across your institution. Upon sign-up, users can affiliate with an institution from their account profile, they will then be automatically directed to the Dataverse for their institution for browsing and data deposit. Institutional Dataverse administrators will set the permissions for their institution’s Dataverse, this can vary from a completely open or restricted (mediated) deposit. To begin customizing this space, you’ll need to have administrative access to your institutional Dataverse. If you are not able to access the features below, please contact us at dataverse@scholarsportal.info and we’ll ensure you have access to these features. If you are not sure about whether you should have these permissions, please contact your participating institution. Upload your logo image and choose how you would like it displayed. Supported image types are JPEG, TIFF, or PNG and should be no larger than 500 KB. The maximum display size is 940 pixels wide by 120 pixels high. Select your header colours for the background, links, and text. Enter a tagline, and a URL for your institution. A tagline is required to add a URL. Your institution’s Dataverse will now have your customizations. If you have any issues with logo sizing or display, please contact us! 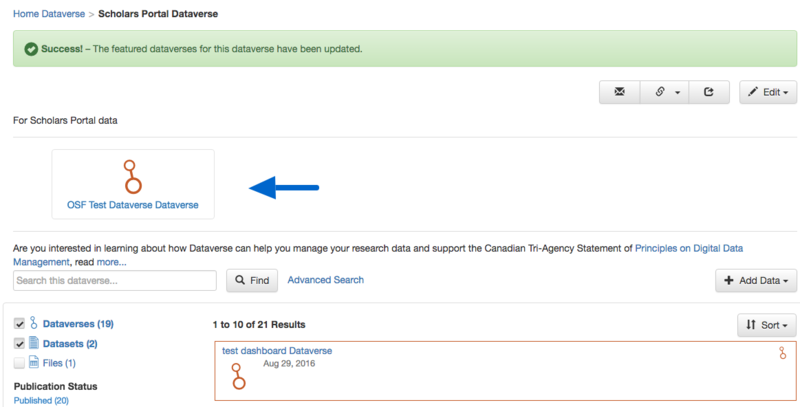 Within your institutional Dataverse, you can set featured Dataverses that will appear along the top of your institution’s page. You can add all sub-dataverses to this list to give users a place to easily browse, or use this as a place to highlight interesting or notable research data. Move Dataverses that you would like to feature from the list on the left to the list on the right. Click “Save Changes. The Dataverses selected will now appear along the top of your Dataverse. Check the boxes for fields you want to be used by default when users upload data in your Dataverse. Click “View Fields” to expand and set metadata fields as required or optional with each metadata category. Move items into the “Selected” column on the right in order to add them to the facets. Click “Save Changes” at the bottom of the page. Your facets will now be available on the left sidebar of your Dataverse. As the administrator of your institutional Dataverse, you will have full permissions to add, edit, and remove user access to your Dataverse. In the “Permissions” section, click the “Edit Access” button. Select who can add to the Dataverse, and the default role that will be given to anyone adding datasets to your Dataverse. Dataverse has flexible permissions settings, which means that settings are customizable for your individual institution. 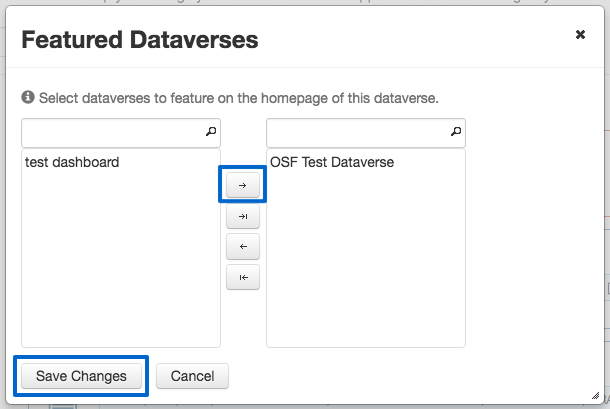 Within the Edit Access menu, you can decide the requirements that determine 1) which types of users can add datasets and sub Dataverses to your Dataverse, and 2) what permissions they’ll be granted for datasets when they do so. The first question “Who can add to this Dataverse” allows you to determine how open your Dataverse is to new additions – you can set whether or not the entire user base (all logged in users) has the ability to add datasets or sub dataverses to your Dataverse). Anyone adding to this Dataverse needs to be given access This completely restricts all users from uploading data directly to the Institutional Dataverse unless approved by admins. Anyone with a Dataverse account can add sub dataverses This allows users to create sub dataverses (and datasets within their sub dataverses). Sub dataverses will inherit permissions from the parent institutional dataverse. Therefore institutional admins will automatically be given admin access to these sub dataverses (and any other sub dataverses). Anyone with a Dataverse account can add datasets This allows users to create datasets (but not Dataverses) directly within your Institutional Dataverse. Institutional admins will have permission to access or edit these datasets. Anyone with a Dataverse account can add sub dataverses and datasets This allows users to upload and create sub dataverses and datasets directly in the Institutional Dataverse. Sub dataverses will inherit permissions from the parent institutional dataverse. Therefore institutional admins will automatically be given admin access to all sub dataverses . Institutional admins will have permission to access or edit the datasets. 2. The second question on this page allows you to choose the default role (and thus the permissions) granted to users who add a dataset to your Dataverse. The role you select will be automatically granted to any user who creates a dataset on your Dataverse, on that dataset, at the moment that he or she creates it. The role the user is given determines his or her permissions for the dataset they’ve created. As shown in the table below, the key difference between the two roles is that Curators can publish their own datasets, while Contributors must submit the dataset to be reviewed before publication. Additionally, curators can manage dataset permissions. Note that this setting does not retroactively apply roles to users who have previously added datasets to your Dataverse; it only applies to users adding new datasets going forward. Both of these settings can be changed at any time. Scholars Portal recommends all institutional dataverse admins regularly monitor activity in their Dataverse. We do not recommend the “Curator” role as default for your institutional dataverse, as this provides an open deposit that could allow users to upload malicious or inappropriate content. The following table provides examples of the recommended settings and the expectations in terms of actions for admins. 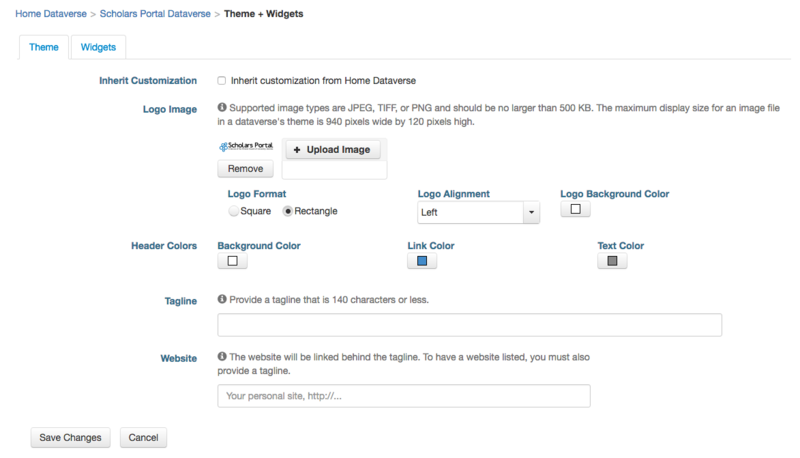 Select “Edit” in the upper right corner. Select “Permissions” in the drop-down menu. Click the “Users and Groups” menu to see what users currently have access to, then click “Assign Roles to Users/Groups”. Enter the user or group name. As you type, suggestions will appear. Click the user name that you would like to add permissions for. Select the role for the user. When each role is selected, you will see a description of that role on the right side of the page. Warning: Any role assigned to a user at the Institutional Dataverse level will be assigned to this user for any dataset deposited directly in the Institutional Dataverse. This role can not be revoked at the dataset level. The linking feature in Dataverse allows for links to be created to other Dataverses within your own Dataverse. For example, if you are depositing data from research done across multiple institutions, you may want to deposit it in the Dataverse of one institution, but then link to it in the Dataverses of the other institution(s). Important Notice: Linking Dataverses is currently restricted to super admins of the Scholars Portal Dataverse. In the current Dataverse version, these links cannot be deleted once created. If you are interested in using this feature, please contact us. For more information, see the Harvard Dataverse User Guide or contact us.